The idea for a state organization was formed when a group of collectors got together at the Corn Belt Coin Club Show in 1959 to discuss numismatics in general. The first organizational meeting was held at the Peoria Coin Club Show at the Hotel Pere Marquette in September of 1959. Goals of the new State organization were to further numismatics through knowledge and to promote annual three-day shows around the state by hosting clubs. Officers elected at this first meeting were: President-Ralph Winquist of Rockford, Vice President-Glenn Murphy of Armington, Treasurer-Bob Okell of Bloomington, and Secretary-Marjorie Baker of Peoria. Governors elected were: Lester Beatty, Jesse Peters, James Kaczor, Walter Loud, Connie Anderson, Charles Moler, and Kenneth Mabray. Dues were set at $1.00 per year. 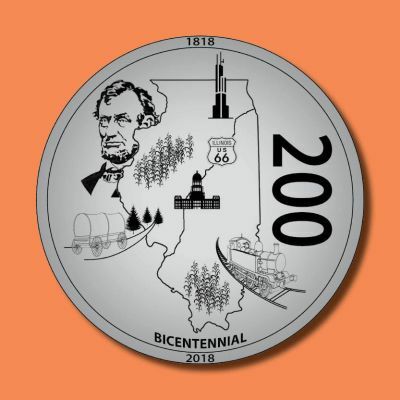 Illinois Bicentennial Medallion. Contest winner was Hayden Schumer of Chatham, Illinois.